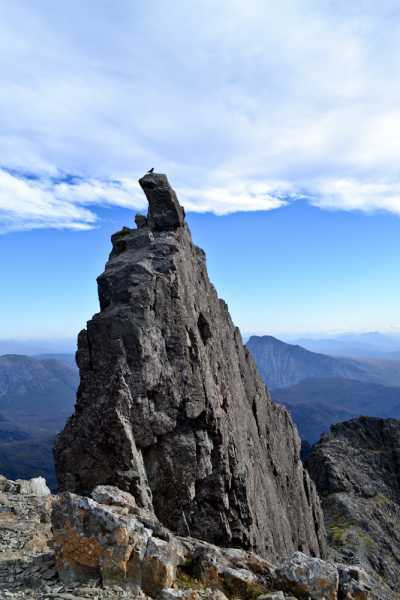 The Inaccessible Pinnacle in the Black Cuillins.If you spend time in the hills, and I suspect some people who visit MountainViews just might, these names alone must draw you in. I had a day walking on Skye and of all the places I wanted to see this was at the top of the list. I was blessed with the weather, a stiff breeze being the worst thing I encountered, whereas the locals had spoken of rain since the previous Christmas. Starting from Glenbrittle and winding slowly up a grassy slope the first thing that surprised me was a huge crack in the earth with a water fall gushing downwards. Ascending further the grassy terrain gave way to a tortured crucible of rock and a steep rough climb to the ridge of the Black Cuilinns near Scurr Dearg. During the Paleocene to Early Eocene Skye formed one of the main volcanic centres of the North Atlantic.Due to plate movement this area is now located under Iceland. Lavas from the volcanoes cover most of northern Skye, giving a stepped trap type landscape.The dominant lava type is basalt, part of the magma chambers for the volcanoes are exposed at the surface as major intrusions of gabbro and granite.The Black Cuillins are formed of gabbro, which erodes to form the characteristically jagged outlines.